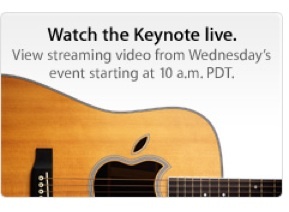 Apple’s live stream of today’s media event? One big smokescreen. Really, it’s all about Apple’s content-streaming future. Apple’s stunned everyone by announcing a live stream of today’s special media event. It’s handy, public-friendly and a great PR moven–as long as you have the requisite Mac, Safari, and Snow Leopard OS. But it’s a smokescreen. Really, it’s all about Apple’s content-streaming future. Today’s September special event will be streamed live from San Francisco to the rest of the world, so that everyone with an interest in Apple’s products can experience the magic of a Steve Jobs product reveal in real time. It’s surprising, pleasant, and it’s going to be fun. If, that is, you’re using a Mac, an iPhone, an iPod Touch or an iPad–because Apple is using a new system called HTML Live Streaming. Despite the reported benefits of this method for transmitting video (it can be viewed easily in-browser, and has fewer router and firewall problems as it uses existing widely-accepted HTTP protocols) very few people have adopted it yet. As this handy guide notes, there is a way you can view the live stream by using video player app VLC on a PC, but it’s going to be a haphazard affair as VLC isn’t set up to accept a continuous live video stream in this way. But this isn’t Apple being stupidly bloody minded, or flicking an inappropriate finger gesture at the PC-loving world. It’s a neat way for the company to achieve one behind-the-scenes task: Test out its mysterious new North Carolina data center, specifically relating to how well the hardware and its Net-connecting pipelines can cope with streaming large amounts of video data at speed to numerous viewers around the globe. We know this courtesy of an insider who’s spoken to CultofMac. And that may then reveal the real secret here: If Apple is making a live video web-cast of its media event, and testing out back-end and software-related issues with streaming content to Apple devices, then can we suspect that it’ll be revealing streaming TV show deals and possibly even the revamped Apple TV today?